A male northern shoveler seen at 14-Acre Pond in Norwalk, Conn., fall 2018. Matt (and probably many others) got it right from the start: Northern shoveler. A northern shoveler seen at 14-Acre Pond in Norwalk, Conn., fall 2018. Its shovel-like bill is its most distinguishing feature. Both males and females have that flattened bill, but only the male (drake) features this bright plumage. Females are mottled tan or brown, like many female ducks. One last hint photo before I reveal the answer. This photo hides this bird’s most distinguishing feature. Here’s a quick birding quiz for your Tuesday. The answer will be revealed later today when I post the most recent For the Birds column. Hint: With winter approaching, people throughout New England are seeing different visitors at their feeders as birds “irrupt” from the north and west. So what is this guy (or gal)? At second look, maybe this one wasn’t so easy. 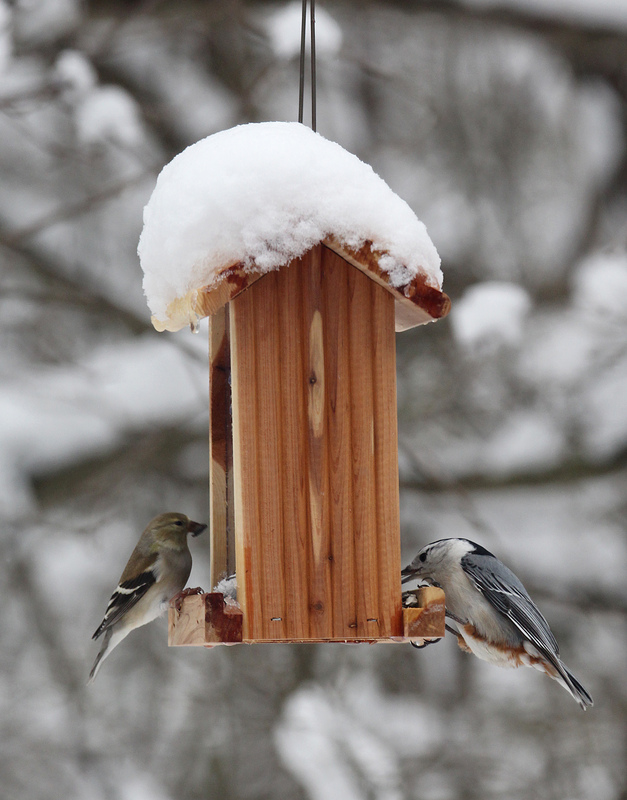 The most popular answers — chickadee and titmouse — are indeed common backyard feeder birds, so they are good guesses. It also does look like a blue jay — the third-most common answer — as it’s hard to gauge how large the bird is in the photo. Only 10 percent of participants got it right: white-breasted nuthatch. The giveaway is coloration (although it shares blue, black and white with blue jay), especially the rusty red feathers exposed as it flies. Of the options given, it is is only bird that features that rusty red. The photo above was taken a few seconds before the one of the nuthatch flying off. It’s been a while since I’ve posted a quiz, so let’s get back into the swing of things with a relatively easy one. 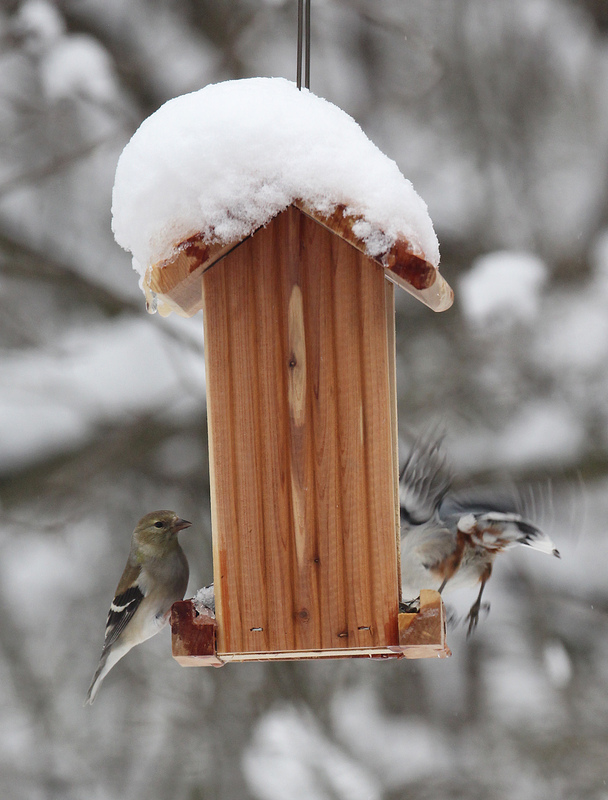 What was sharing the birdfeeder with this winter-plumaged American goldfinch?